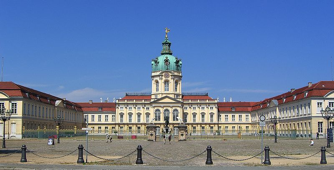 There are many castles in Berlin with the Charlottenburg Castle being the largest of them. Originally a small summer residence and built in the end of the 17th century, it was situated outside the town (7,5 km from the Berlin center) and served as a seat for the elector Sophie Charlotte. Sophie seeked a simple life and often had musicians, artists and scientists to visit her. Once she had become queen of Prussia, the castle was not longer big enough for her needs. Her husband, Frederic I., called a famous architect to give the castle its present day's appearance. After Sophie Charlotte's early death, Frederic called the castle "Charlottenburg”. Nowadays it is situated in the Berlin district of Charlottenburg which again is named after the castle. In World War 2 it was partly destroyed, but fortunately restored after the war. 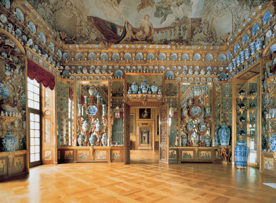 Today it serves as a museum for furniture, bone china, tapestries and paintings of the 18th century.